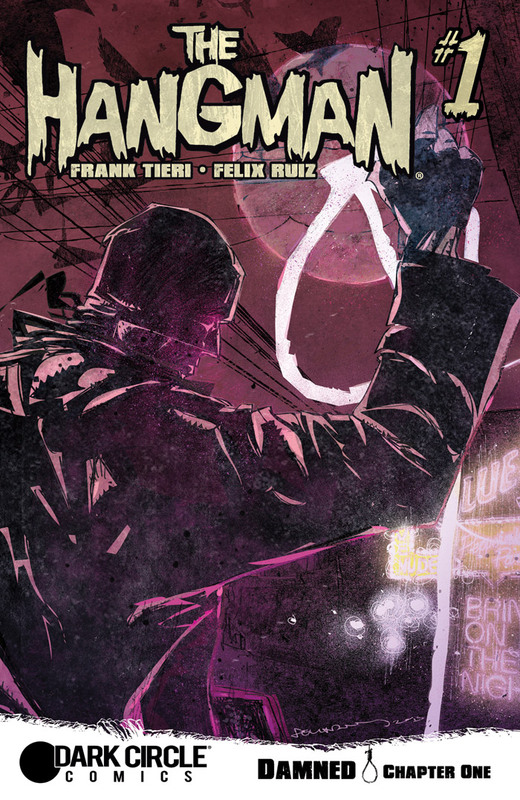 'The Hangman' #1 is putting the dark in Dark Circle Comics as the latest reinvented title from the classic archives of MLJ is released. It's not your typical debut issue as the titular character doesn't make an appearance until near the end but it sets a mood and tone you can expect going forward in the series. This bloody tale is one of crime, punishment, redemption and the boogeyman they call the Hangman. Frank Tieri deconstructs the opening issue trope by starting with a schmuck named Mike Minetta and not our hero (or is it anti-hero?). He's great at putting a smile on his face to his family while a bound man is stuffed in the trunk of his car. Apparently, this poor guy messed with someone's wife and it's Mike's job to dispose of him for good. The method in which he chooses to deal with this guy involves strawberry jam and it should make your skin crawl as it did mine. Before Mike's job is finished the poor sap about to die warns him there'll be hell to pay. That's some interesting talk from a dying man so Mike laughs it off. The Hangman will come for him he says. Whether myth or legend or just the boogeyman to criminals, the supernatural force eventually appears and it's a brutally visceral sequence that comes near the end. Felix Ruiz's style is pulpy, realistic, and downright dirty. The thick pencil-work and dark inks provide a noirish feel to the scenes and Kelly Fitzpatrick does a wonderful job of infusing the pages with a somber atmosphere of muted colors. It's as if the colors want to escape the darkness held by the central characters, but they're not allowed to look away from the gore in front of them just like the reader. I'll admit 'The Hangman' won't be for everyone. The pacing is quick, perhaps too quick as it leads to one reveal and then it's over with a mysterious cliffhanger. It reads more like a prelude than a fully realized issue but it's so well done, even in a fleeting way, I can forgive that and look forward to more. 'The Hangman' #1 does what great first issues should do and that's make you want more.